With the fight to save Cairns' historic waterfront Yacht Club now in top gear, a similar story under a previous Queensland Government bears retelling. The story of the elegant and much-loved hotel that held a place in Queensland’s political history, and how a wilful premier won the battle to knock it down. Joh Bjelke Petersen’s decision to demolish the iconic Bellevue hotel had repercussions he never imagined. Built in 1885, the Bellevue was part of an elegant precinct on the corner of George and Alice Streets in Brisbane. The other corners of the intersection still retain old Parliament House, the city Botanic Gardens and the Queensland Club. For 100 years, the Bellevue served as a premier hotel and prominent Brisbane landmark. In 1967 the State government purchased the Bellevue to make way for new government buildings. Intense local pressure to save the Bellevue gave the building a reprieve. In 1974 in an attempt to make the structure less appealing for preservationists the government of the day had the verandahs and distinctive filigree cast iron features removed. In spite of this, public support for the Bellevue continued until after 12 years in government hands it was demolished in the middle of the night of 20th April 1979. The destruction of the Bellevue was a catalyst in changing the way Queenslanders saw and valued their heritage that ultimately led to the introduction of legislation to protect heritage buildings. It was more than a hotel, and was frequented by graziers, politicians and international celebrities alike. It is said that Politicians would sit at the Bellevue Hotel listening for the bells to ring before going back to Parliament House. The Hotel was home to 27 out-of-town parliamentarians. "On the night of 20th April 1979, a large crowd had gathered around the building. There was a cordon of police. They had thrown up a barbed, a mesh wire fence around it. The Deen Bros arrived, rolling through like an armoured division, straight through the crowd. People were knocked sideways. Police were dragging people out of the way. Parking meters were knocked over. Traffic signs were bent and twisted on the road. It looked like Stalingrad. There was outrage in Queensland Parliament and with the general public. 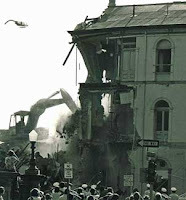 Under Premier Sir Joh Bjelke-Petersen, Brisbane became known as the demolition capital of Australia, famous for midnight assaults on historic buildings. MICHAEL CATHCART: Now, you'd have to imagine that every Australian city and town has at least one building that the locals reckon is so much part of their history that it would be an act of vandalism to knock the place down. But it wasn't so very long ago that the urge to bring in the wrecker's ball in the name of progress knew very few limits. And, you know, veteran ABC 'Four Corners' reporter Peter Ross is still outraged, even after a quarter of a century, at the way a cherished Brisbane landmark, the Bellevue Hotel, met its end. PETER ROSS, REWIND REPORTER: It was here where the top end of town in Brisbane and the graziers from the broad acres met. It was here where romances blossomed and courtships happened. The GIs during the war had a ball here. Politicians made the Bellevue a home from home. For anyone with half an eye for beautiful colonial architecture, the Bellevue was a prime example. Its destruction was an outrage. TERRY GYGAR, FORMER LIBERAL MP: A large crowd had gathered around the building. There was a cordon of police. They had thrown up a barbed...a mesh wire fence around it. And then the Deen Bros arrived, rolling through like an armoured division, straight through the crowd. People were knocked sideways. Police were dragging people out of the way. Parking meters were knocked over. Traffic signs were bent and twisted on the road. It looked like Stalingrad. PETER ROSS: This was Joh Bjelke-Petersen's Nationals running rampant. The Government had bought the Bellevue 12 years earlier and was determined to redevelop the site against all opposition. The Queensland Government was a National Party/Liberal Party coalition. But the Government was simply one man: Joh Bjelke-Petersen - deeply religious, deeply conservative. A man who used incoherence as a weapon. JOH BJELKE-PETERSEN: This is quite beside the point. I'm telling you what the point is. I'm telling you what the issue is. PETER ROSS: Bjelke-Petersen simply didn't care what anyone else thought. Liberal Terry Gygar remembers feeling helpless to stop the demolition of the Bellevue. TERRY GYGAR: Here we were, a group of members of the parliament of Queensland in the governing parties, totally powerless to put a stop to this outrage as it was happening. PETER ROSS: So do you think it was Joh who did all this? TERRY GYGAR: Queensland was Joh at the time. But this was just a straight, "You can go to hell. We're running things and we don't care what you say." BOB KATTER, FORMER NATIONAL PARTY MP: We did act in a callous disregard to their interests, because we saw them as self-indulgent, you know, citified sort of people that would be concerned about ridiculous things like that when people were going hungry. PETER ROSS: Bob Katter was a National Party man who'd made a success of the Aboriginal Affairs Ministry. He was a young man on his way up and the Bellevue meant nothing to him. BOB KATTER: You know, we were bush people that had to build something out of nothing out there in the wilderness and aesthetics really wasn't our long soup. I was brought up under a galvanised iron roof, on an open verandah. I mean, Joh spent a fair proportion of his young life living in a shed. And that was not uncommon with all of us. Smashing the Bellevue, to me it was just an amusing thing that happened in Brisbane. It didn't concern me much. PETER ROSS: Why the heck did they do it? Well, why did they do it? GEORGE ADMAN, FORMER BELLEVUE OWNER: I don't know, really. PETER ROSS: George Adman's family had owned the Bellevue and he'd managed it for a number of years. He'd learned of his old family's hotel's destruction from the Melbourne newspapers. GEORGE ADMAN: The deceitful way they moved in with the bulldozers at night and destroyed it. And you had a feeling of, well, sadness and horror that it could happen. PETER ROSS: This is the first time George Adman has come back to the site of the Bellevue. GEORGE ADMAN: It was a tremendous building and it had a lot of memories. I had the memories of the war, all the servicemen, overseas visitors, all the artists - Katharine Hepburn, Robert Helpmann, Nat 'King' Cole, Frank Sinatra, Louis Armstrong. Katharine Hepburn remains a very fond memory. She used to send Christmas cards to my mother every year for many years. PETER ROSS: Did she keep in contact with the United States when she was here? GEORGE ADMAN: Yes, she used to ring Spencer Tracy every night. GEORGE ADMAN: Yes, every night. There would be a mass of phone calls. PETER ROSS: For a while the parliamentarians were very happy to use the Bellevue. GEORGE ADMAN: They used to come across to the Bellevue. They had their own private bar and lounge. And when they used to ring the bells they used to quickly rush back. PETER ROSS: Happy memories not withstanding, the Bellevue came down. After all, it was just another Brisbane building. PETER ROSS: How much was that a country town thing? BOB KATTER: Oh, you know, it very much was. As I said to you before, that we were very much bush boys. We just had an old building that was falling down and to us it needed to be rebuilt. So it had a beautiful facade - well, what were we going to do? Spend tens of millions of dollars of taxpayers' money to build a building that, really, can't possibly be repaired except to rebuild it the way it was, which then is very inefficient. DEEN BROTHER ON NEWSREEL: Construction and reverse construction, better known as demolition. PETER ROSS: That's right, reverse construction. BOB KATTER: The Deen Bros were people that could do hard jobs and get them done. And, you know, their appearance, you know, and their name may lead you to believe they're not Australians, but they're the most Australian people. (Laughs) They were very typically, you know, Australian and particularly Australians of that era. PETER ROSS: The demolition of the downtrodden, but much loved, Bellevue Hotel was a sad fact. The bigger story was the damage that it caused the Coalition. TERRY GYGAR: It was the beginning of the end. The Bellevue was a big turnover point of a lot of things in Queensland. It was basically the rejection of Coalition. BOB KATTER: I was crying a bit because I thought we might lose some votes, but I wasn't crying about the Bellevue. And of course all those Liberals standing over there crying, I thought they were screamingly funny. I thought they were screamingly funny. But when I started to think about the political ramifications of it I didn't find it so funny. PETER ROSS: The forlorn legacy of the Bellevue is this, the old site of the hotel. It's unnamed, unloved and unvisited, distinguished by one thing alone - a very odd sculpture of Her Majesty the Queen looking as though she really would like to be somewhere else. But, in fact, there was an upside to all this destruction and considerable irony. Let's take the irony first. The boys from the bush got a shock from the political reaction. BOB KATTER: Well, I mean it had a very, very jarring effect. I mean, it did no doubt have a very, very jarring effect. You know, we needed those seats in Brisbane and obviously there's very strong feeling about these things in Brisbane. PETER ROSS: Joh Bjelke-Petersen decided that Bob Katter should be minister for heritage. BOB KATTER: I said, "To me, the sound of a jack hammer is like Slim Dusty music." You've got the picture? I'm the last person on the planet to be heritage minister. PETER ROSS: The biter bit. Katter became heritage minister and enlisted the aid of Anne Garms - a first-rate businesswoman, cultural conservationist and a lover of the Bellevue. ANN GARMS, CONSERVATIONIST: It heightened people's awareness of how important our cultural and built heritage is. And the Bellevue was a fine example. So it really got people motivated to look around Brisbane and enjoy and appreciate what we had and try to preserve. PETER ROSS: Anne Garms rescued this window from the rubble and put it into the home she was building. And she guided Bob Katter and the Nationals into a new way of thinking about heritage after they destroyed the Bellevue and the Coalition. BOB KATTER: For all of us it was a fall off our horse on the road to Damascus. TERRY GYGAR: I think the Government was quite shocked by the response of the public and the realisation that heritage did mean something to people. I mean, at the time, Parliament House was under threat - physically under threat - from these termites that were eating their way through it and there were even wild rumours that they'd pull it down. I mean, the Government weren't totally stupid. They saw what happened. In fact, the new beautiful Parliament House - the restored Parliament House - is a legacy of the Bellevue. I think we've got the most beautiful parliament in Australia now. The Bellevue died to save it. Now it's time to claim and own a revitalised Cairns Yacht Club, with all it's colourful history, for another 100 years. INTERESTING READ. THANKS VERY MUCH MIKE. LET'S HOPE PREMIER BLIGH READS IT, BECAUSE IF THE POLITICIANS DO NOT SIT UP AND LISTEN TO THE OUTRAGE THAT THE LOCAL PEOPLE OF CAIRNS ARE PORTRAYING RE: LOSING THE CYC, THEN IT WILL BE AT THEIR PERIL, JUST LIKE JO BJELKIE PETERSONS. YOU, YOU, YOU, YOU, YOU JUST MARK MY WORDS!! !